Just before going to bed last night I remembered that I needed to attach the white plastic baffles to both the air vents for the fridge. These have to be fitted when the temperature drops below 10˚C to reduce the outside airflow around the back of the fridge. Whilst doing that I realised I'd ignored one of my own tips which was to always park to the bottom end of an HGV parking space so that if and when the tractor unit starts up the engine is as far away from our bedroom as possible, and likewise when using a car and caravan space. Use the first one, so that if an HGV cheekily grabs the spaces in front of us its diesel engine, which may fire up during the night, will again be as far away from our bedroom as possible. So that was the second chore before going to bed - move the vehicle back a space. We decided to sleep with the gas central heating running all night on a low setting so as to ensure our habitation area stayed comfortably warm. As the night progressed it needed turning up higher, which isn't surprising given that by this morning we had slept through quite a frost, though to my surprise I didn't have to de-ice the windscreen as the sun was shining down on it and I had placed a silver screen shade inside so that reflected the heat back on to the screen. Today's plan was to drive further up the road before heading across country for Chartres on the N154, then on to Dreux, Evreux and Rouen, before heading east towards Calais. Rather than fill the tank up at the Truckstop charging about €1.60 a litre for diesel we decided we would fill up whilst travelling across country as it should be far cheaper. As it turned out there wasn't one filling station before we reached Dreux, and by then I was down to a quarter of a tank. There was no option, I couldn't risk going any further without filling up and so we dived off in to Dreux where we came across a 'Hyper U' supermarket and filled up for €1.38 a litre. Needless to say just a few miles further down our route we passed several filling stations. Odd though that there was not one on the southern end of our cross country journey. We usually use that route as a way of avoiding going near Paris. The reason I didn't use it on the way down was because I had a good load on and didn't want to be encountering lots of roundabouts etc. I have to say though, that after today it is losing its appeal. Lots of speed limits have been reduced, lots of 80kph/49mph & 90kph/55mph, even much of the dual carriageway along the route was restricted to 110kph/68mph, this meant we spent a lot of time tangled up with the HGV's though it is still preferable to getting any closer to Paris. I have to say Rouen really is an industrialised, ugly, dump, and is always tricky to navigate through or around, and makes Blackburn in Lancashire look like Henley-on-Thames by comparison. We arrived on a lovely sunny day, though again with some fog out in the sticks, here at Cite Europe at 15:45, having travelled 266 miles, so that's a total of 1,007 miles since leaving Benicassim on Monday morning at a total journey average of 59mph at 27.6mpg. The cost of the fuel and tolls will be included on the spreadsheet which I will post once we have the bill in from the toll road people. It's been a long journey, and in future we'll look to use the ferry from Spain as it is so much easier, I'm sure the costs are similar, though I imagine the ferry fare will be much higher in the summer season. So that's it then, we'll spend the night here before driving the very short distance to the Le Shuttle terminal for our booked 12:50 crossing tomorrow. By the time we come back over the Channel again in early September our politicians should have put the final touches to the Brexit pantomime. They may even be able to get us out by the year 2050. At our time of life it doesn't bother The Chef and I either way. If we 'Remain' then we can carry on with our lifestyle unhindered, and if we 'Leave' then we get back control of our destiny, but it won't effect us too much at our age. For us it's the principle of the thing. Either we're in a democracy or we're not. The 'Leave' camp won the vote, it was a democratic process which 48% of the population on this occasion disagreed with the result. Every trick in the book seems to have been used to overturn the result, and that sadly, coupled with the incompetence of our politicians, has greatly weakened our negotiating position. I tend to believe the recent communication from Jean-Claude Juncker the EU Commission's President to the leaders of the EU 27, saying that they had got almost everything they wanted out of the UK in the negotiations, and that we would be tied to their regulations for many years to come. Little wonder they're unwilling to renegotiate the agreement. So the Wicked Witch is going to have a job spinning that one to Westminster as some kind of good deal, though it's better than Comrade Corbyn's latest idea which is to demand everything the 'Remain' camp want but to call it 'Leave'. I just hope they now crack on getting new trade deals around the world, but confine them purely to trade and not start including generous visa arrangements with developing countries such as India, otherwise we'll have folk arriving here on 'holiday' only to disappear in to the black economy, probably in a sweat shop somewhere working for people like Turbans-R-Us. I can see why some of them would want to come, I'm sure a new pair of flip-flops from Harrods would be real one-upmanship on the neighbours back home, especially the ones with cut glass crystals stitched on to the straps for evening wear. So the arrangement would be reciprocal, in that I could go on holiday to India more easily and for longer. Would I want to? The thought of walking around dodging piles of human pooh wearing flip-flops whilst balancing a tray of popadoms on my head doesn't fill me with wanderlust I'm afraid. And what would we trade in? I suppose they would sell us things like silks and fine materials while we sold them stainless steel folding shovels to dig their latrines and watering cans, so they could boast of having a flush toilet. As this blog has had something like 67,000 visits by folk kind enough to show an interest since I created it three years ago (visitor count shown bottom right of home page), I recently shared a little bit about myself, and will now share some final thoughts to personalise the blog a little more, though in future it will revert back to just being just about The Chef and I on our travels. First then, how we make our way in the world. I call it 'The Escalator of Life'. When each of us is born we step on to the bottom step of an escalator, just like those very long ones you get on London Underground. The period between stepping on at the bottom and stepping off at the top is the period of our life. Like most escalators we stand to one side one behind the other. We are leaving space beside us for those who wish to bound past, such is their hurry to reach the top. Such people include those who take drugs, drive without seat belts, drive fast and recklessly, involve themselves in gangs, and other dangerous pursuits. How sad that they are in such a hurry to reach the top of the escalator, and it's end. Sometimes there'll be folk who at a certain time in their lives will want to try and slow the journey down, so thow on some jogging gear, turn round and try and run back down the moving escalater, though eventually they tire, realise it's a waste of time, turn round and rejoin the queue. Behind us, in the order of things are our children, and maybe grandchildren, moving upwards on the escalator. As they grow up they run the risk of doing something foolish, and we're there to put our arm out to stop them passing us, to protect them, and hope they don't push that arm away, for we can only do so much to protect them. Sometimes they'll just give that arm a gentle push, and that's their way of saying, "I know the risks, but I want to give it a go, I want to be adventurous", and we slowly drop our arm and place it on their shoulder as a way of saying "Go for it. Good luck and be careful". I have had such moments in my life with both my daughters, of whom I am enormously proud, they turned out just fine, despite having me as their father. 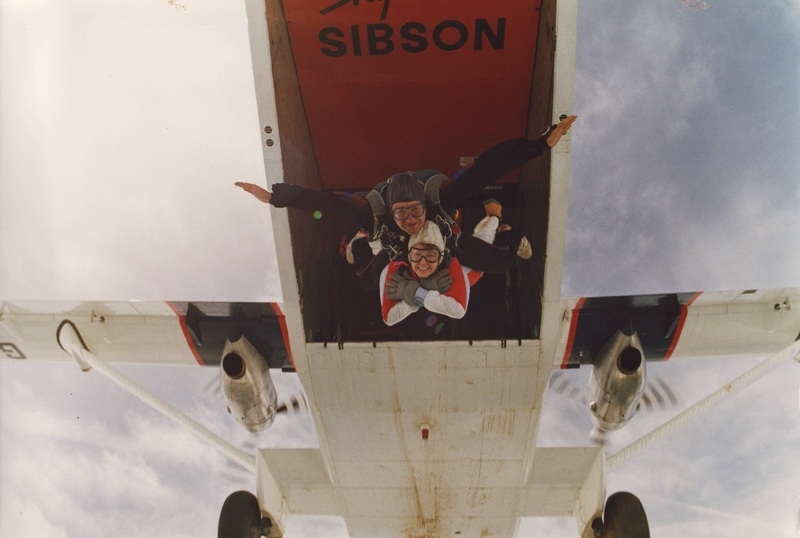 Many years ago my eldest daughter Clare decided to try and overcome her fear of heights by doing a skydive, something I would never do myself, I wouldn't have the courage having seen the results of what happens when things go wrong. Diving in tandem doesn't make it any safer, it just means you don't die alone. But jump she did. I take my hat off to her. 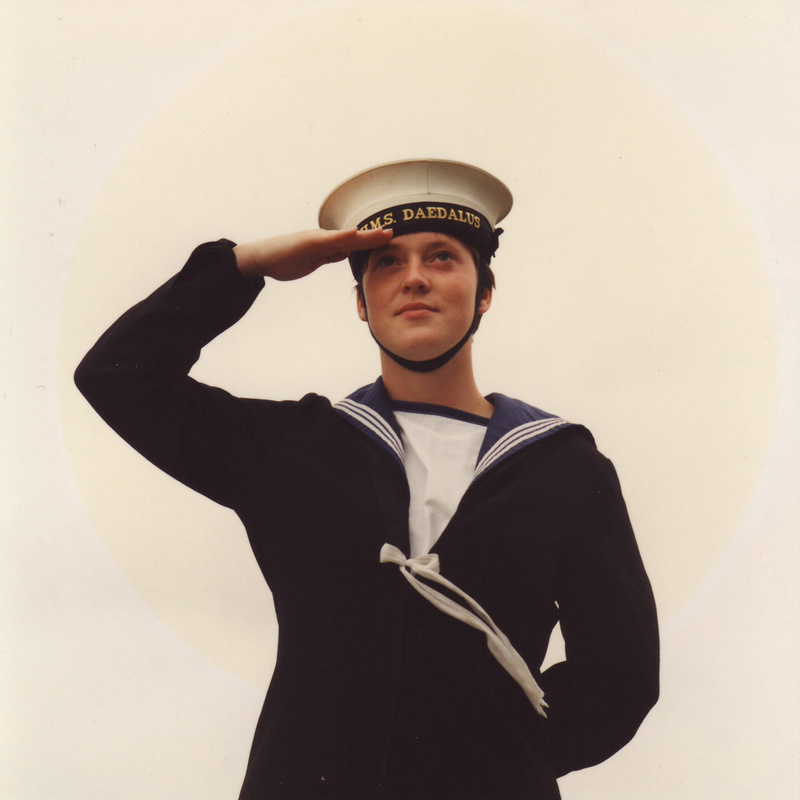 My second daughter Nicola joined the Royal Navy as an apprentice specialising in the servicing and maintenance of helicopter airframes and engines. 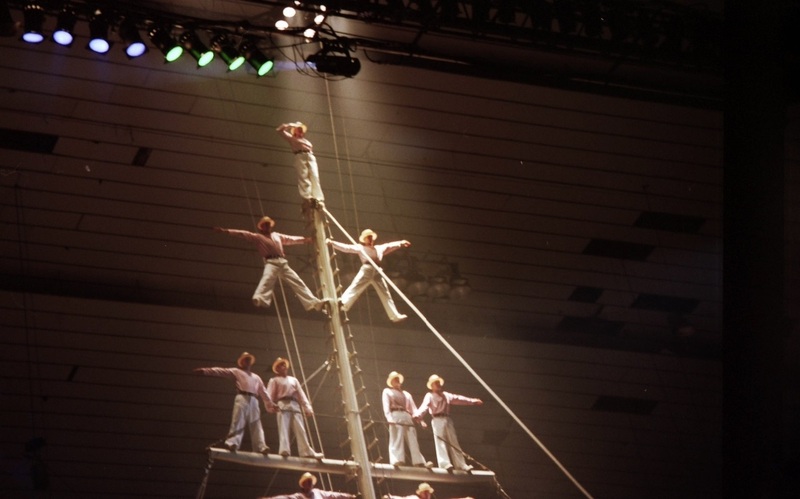 During her first year of apprentiship her intake were required to tour venues during the summer season with a Mast Manning display. 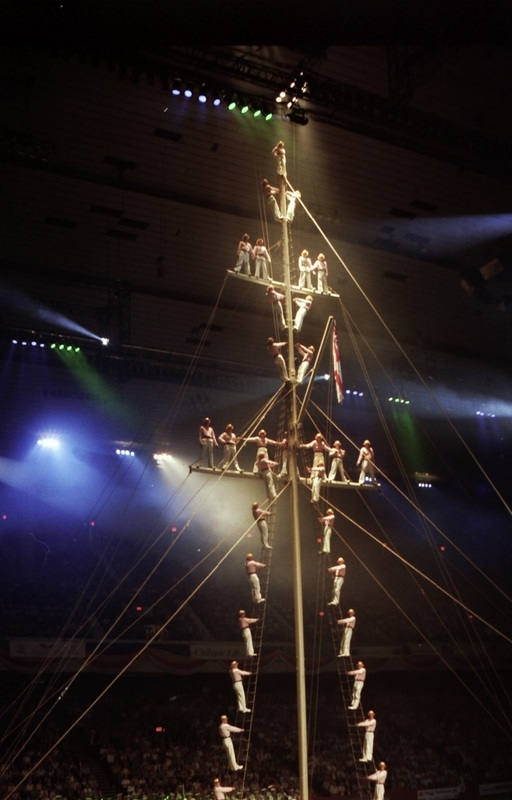 A historical ritual where in the days of sail, naval ratings would man the mast as a way of honouring senior officers. Nicola fancied a bash at becoming the 'Button Boy' who stands at the top of the mast, something a female had never in the history of the Royal Navy ever done. 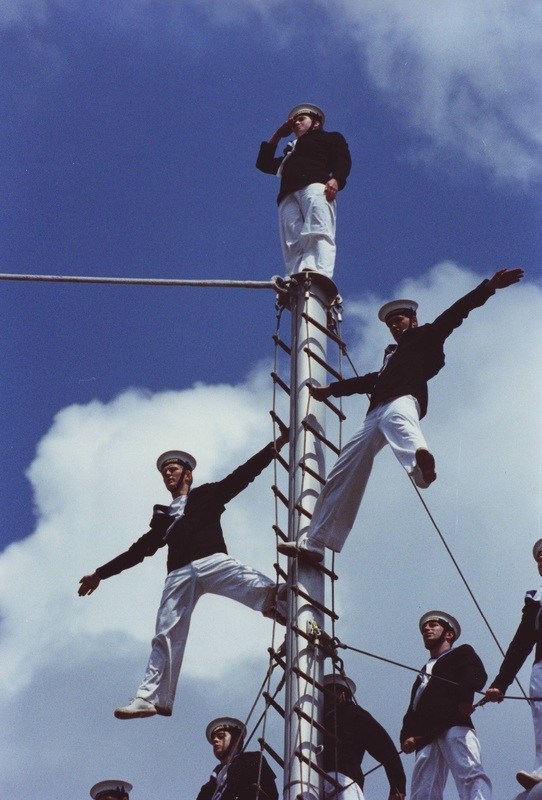 I advised her that if she wanted a crack at it she should tell her senior officers so that they could prepare her physically because it wasn't so much the climbing to the top of the mast and standing there but the physical strength of climbing back down on the long rope that was the challenge. 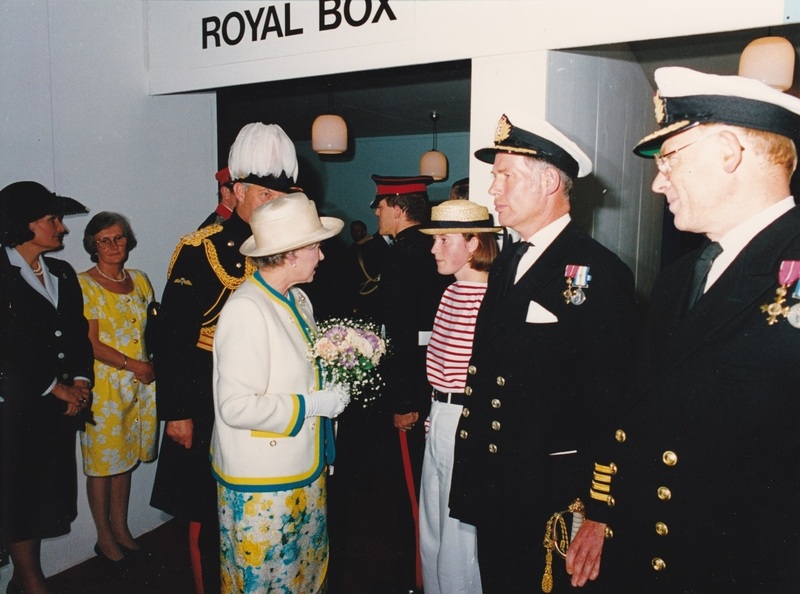 Anyhow her instructors prepared her well and at the Peterborough Showground in 1992 Nicola became the Royal Navy's first ever 'Female Button Boy'. The following year she was asked to join the 1993 team as the Queen wanted to see the 'Female Button Boy' perform. She was to perform during the Royal Tournament at Earls Court in front of most of the Royals at various performances. Unfortunately she sustained an arm injury in training and was booked off sick by an RAF doctor on site. But being her dad's daughter she disobeyed the 'sick note' so that she could perform just once - for her Majesty The Queen. This was good for the reaat of the display team because it then gave them the opportunity to be the 'Button Boy' in her place.Her mother and I were very nervous watching that display knowing that she was suffering a weakness in her arm, and we knew from a post display photo-shoot that the mast itelf wobbled like mad near the top and anything could have gone wrong. Thank God it didn't and she completed the performance receiving a souvenier coin rather than the traditional tot of rum from Her Majesty at the end, and was presented to her in the line-up after the show. 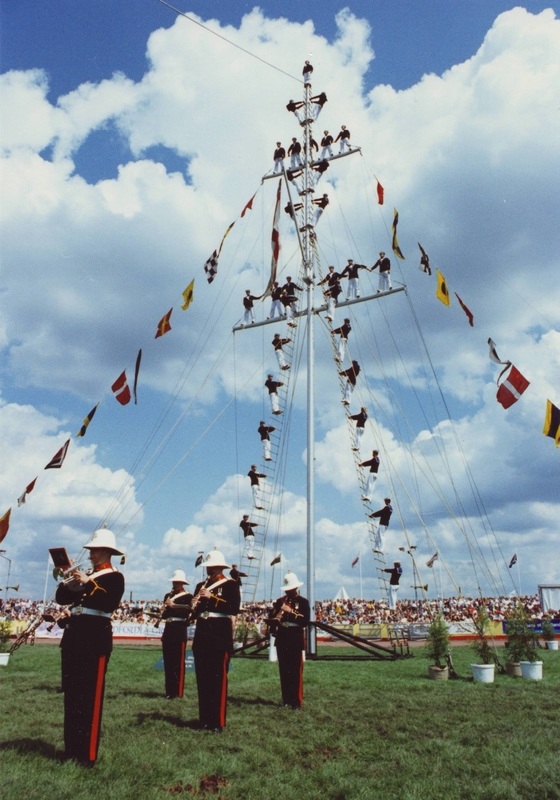 A couple of years or so later, whilst performing at the Royal Suffolk Show the young Button Boy froze part way down the rope, and hung there a while before falling, hitting the ground very hard and breaking his back. All future planned displays were cancelled and the team disbanded, and in all honesty I don't think it will ever be reformed because 'Health & Safety' and 'Duty of Care' will result in so many safeguards that it will never be realistic enough to be worth the expense and effort. So my youngest daughter, the mother of my grandson Alexander, remains and is likely to always be the Royal Navy's first, and only, 'Female Button Boy'. So you see that's another one of those occasions when you have to drop your arm and place your supporting hand on their shoulder and say "Go for it, good luck, and be careful". So there we are, just so long as we all stay in the correct order on that escalator of life, all is right with the world. Things will be as they should be. I suppose we all have our own idea of what lies beyond that bright white light that greets us at the top of the escalator. Personally I hope that I'll be greeted by past loved ones and family, and get the opportunity to spend eternity with my darling Rosina undertaking new adventures together, but if I discover it's nothing more than the showroom of DFS offering their 'This One Lasts for Eternity' sofa sale, I'm going to be really annoyed. As for me I've got to get back in to trying to learn sign language. I was hoping to spend lots of time doing it in Spain, but the problem was finding somewhere to wave my hands about without drawing attention to myself, and I must pluck up the courage to go and see 'Blind Brian' for a haircut. I haven't bought his guide dog a treat back so I've no idea what he'll do to my locks. The Chef is always interested to see what he's done with it each time I go. Never mind, it soon grows long again, about the only part of me which does these days. God willing we'll see you again in early September for our France & Northern Italy tour. PS. I have uploaded two of the three videos I am hoping to post. You'll probably need to turn the volume up on your device if you can. Well we didn't have a bad night's sleep at all really, there were one or two HGV's that came and went close to our location but other than that it was peaceful, and fortunately not nearly as cold as I had expected it to be. It took us quite a while to clear Toulouse, what with traffic followed by a long stretch of motorway with a speed restriction of 90kph/55mph due to the congestion, number of slip roads and sharp bends. Then it was fog, caused by the sun heating the very wet ground and creating glorified steam which reduced visibility, though fortunately not to a dangerous degree. Much our journey today was spent on the A20 heading towards Vierzon. Granted it was a freebee length of road, but it wasn't a particularly good one either, with numerous speed restrictions of 90kph and 110kph, again due to the condition of the road. We had lunch on a truckstop in the Brive -la-Gaillarde area which consisted of leak and potato soup which The Chef had created before we set out yesterday, together with some nice fresh bread. We also took on more fuel. This time paying €1.60 a litre. However, expensive fuel or not I needed to get some miles under our belt as progress was slow, so off we went occasionally up to the French maximum speed limit of 130kph/80mph. At one toll booth we came across the 'Yellow Jackets' protesting about the proposed additional fuel tax the little green frog Macron is proposing, and I have to say I do have sympathy with them. Typically I picked the booth with a vandalised barrier. It was in the down position and bent round ninety degrees, and it had been done deliberately because it was bent towards me. I pulled up out of courtesy to engage with a long haired lad with tattoos, and wording and scribbles all over his yellow jacket. Some people just can't get enough of ink in their lives. We didn't understand a word we were saying to each other, but I think he was offering me a ticket to go through the barrier. I just thanked him, pointed to the Tag in the windscreen and moved forward, had it detected, the light went green and we were through. 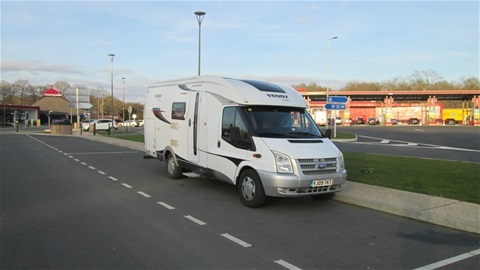 My target today was to reach Vierzon, but we were on a roll and the traffic was fairly light so we kept going to Orleans, where we now sit on a truckstop, yet again cheekily in a designated bay for cars and caravans, but as we have not seen one car and caravan all day, I don't think anybody will be needing it. Today has seemed like hard work, and this is a route I would not choose to use again unless it was necessary. The route we came down on through Clermont-Ferrand was much easier, and I think that will be our preferred route in future. The only reason we aren't using it this time is because the mountains can be up to 3,000ft high and I didn't want any problems with ice or snow. Tonight the forecast temperature for here is -2˚C which is colder than back home. Never m ind, we are now well within striking distance of Calais by the end of tomorrow, so much so that I have just booked a channel crossing with le Shuttle at 12:50 on Thursday at a cost of £120. 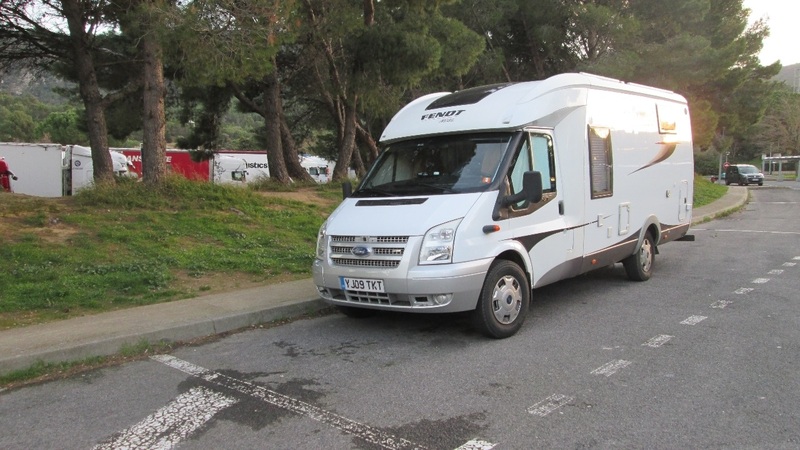 This will give us a bit of time for a look around the shopping complex at 'Citi Europe' as we want to buy a new cordless kettle for the motorhome, which has all European mains electric sockets. So today we have travelled 408 miles and the trip average speed since leaving Benicassim is now 63mph at 27.4mpg. I am now about to enjoy The Chef's evening creation of chicken curry and rice. At the moment the kitchen window and a roof vent are open to get rid of the steam. Never mind once it's ready I shall close, up, turn the central heating on, and enjoy a glass of grapes with the meal. Here's where we'll spend the night. I didn't sleep too well last night, I guess it was the thought of the long journey home that kept me awake. We were up in good time as we had chores to do, and I had set a target leaving time of 10:00. We would have made it too had it not been for the fact that there was a delay in getting our electricity meter read in time. It's quite understandable, as i think there were a number of people leaving this morning and the staff can't be everywhere at the same time. By about 10:20 The Chef had paid our campsite bill, I had handed in my Spanish gas cylinder for safekeeping for the princely sum of sixteen euro's. This means that when we come again I can go and collect 'our' rented cylinder, full of gas, and start using it straight away rather than having to wait another seven days for one to be delivered, and we had said goodbye to our lovely neighbours Bob & Sue, who will be following us home in about a week's time because their new motorhome is due its first habitation (the living area) check, and these things have to be done in a timely fashion to maintain the warranty. We were away, with sad hearts at leaving such nice friendly people, yet looking forward to getting home to all that is familiar. The plan was for us to go to a local filling station, recommended by the staff in 'Reception', well when I say local it was a twenty minute drive in the wrong direction. So when I switched on the ignition and saw that we had three quarters of a tank of fuel, it didn't seem worth making such a detour just to refill the one empty onboard propane gas cylinder we had. So an executive decision was made to start the journey north and refill as and when we passed a suitable filling station. Well, as the miles were eaten away I was becoming a bit concerned as we didn't pass a filling station selling propane gas right up to when we had lunch, but fortunately as we made our way to the Barcelona area we noticed that 'Repsol' filling stations sold 'Autogas', and once we'd spotted that we pulled in to the next one we passed. One diesel tank refilled plus our LPG tank filled by a very helpful young lady attendant and we were in business. I'm sure we would have had enough gas in the one remaining cylinder, but I wanted to make sure, and build in some spare capacity should the weather turn bad on us and we get holed up somewhere. As we journeyed further north we felt we should take another look at our intended route home. I had opted to go via Lyon and Arras in France, but that meant us going quite a long way eastwards before heading north, but at least we would be away from the Atlantic coast should bad weather move in. The other options were to go back the way we came up through central France, and the mountains around Clermont Ferrand which at around 3,000ft might give us problems with ice or snow, or the 'Eastern' route, one we'd used before going via Toulouse, Limoges, Vierzon, Orleans, Chartres, then across country to Rouen then on to Calais. Option three one, and I reprogrammed the satnav to take us to Toulouse, as I guessed that would be all the travelling we wanted to do today, and I wasn't far out as we are now parked up in a Truckstop/Rest Area, just outside Carcassonne, having bagged a car & caravan parking space away from both the main road and the HGV's. We've travelled 333 miles today at an average speed of 55mph and 27.6mpg, which isn't too impressive, but we were fighting strong cross winds and gusts for quite a few miles, and when we weren't doing that I had my toe down a bit. It wasn't until we refuelled just inside the Spanish border at a sensible price, well as sensible as toll road costs can be, and knowing that our next refill would be in France at a considerably higher cost, that I slowed down, and tried to keep the speed to about 100kph/62mph as much as I could. So here we are then, it's colder here (11˚C), and we're already missing the sunshine, but we are about one third of the way home, and we need to keep going. I'm expecting good weather tomorrow so that we can crack on and take a chunk out of the remaining miles we need to travel. 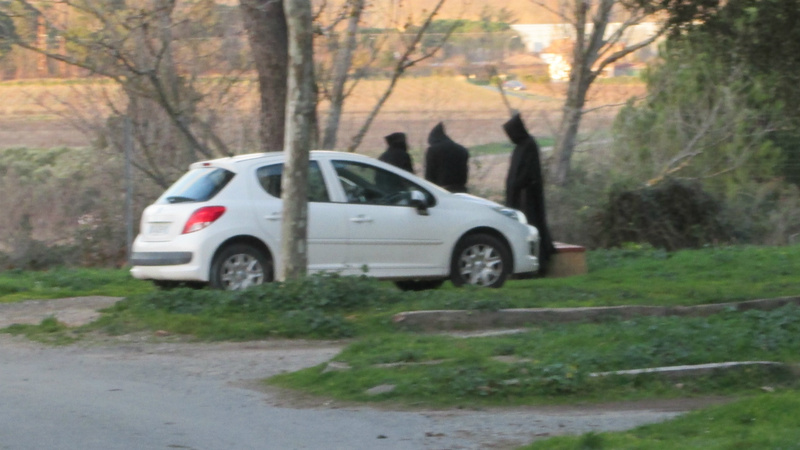 The oddest thing of the day has been on this Rest Area, where I managed to take a very quick photograph of three Druid types standing around a table drinking something. Weird eh?